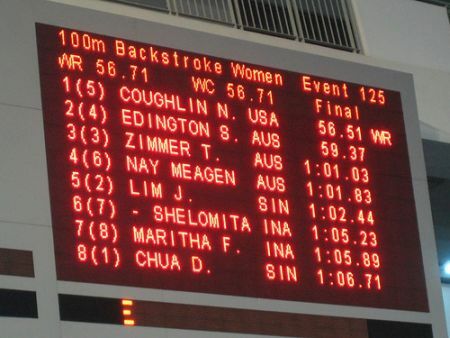 Natalie Coughlin´s world record in 100 back, SCM. Swimming New Zealand named Mike Byrne, formerly Operations and Business Development Manager for Bike NZ, to serve as new CEO. Eamon Sullivan is confident that some high altitude will give him boost as he gets ready for Aussie Olympic Trials in March. Now would you please shut the f##k up?!? Now there seems to no way out of this issue than saying who did offer her and what. She can run all she want but someday she has to face the world and say what she really meant with those words. Vähän informaatiota ruotsalaisen uimaseuran Väsby SS:n kuivaharjoittelusta löytyy täältä ja täältä. Danish SC Nationals 2007 – Fri, Sat, Sun. We covered the first day of Danish SC Nationals here and here are the last three days of competition in one post. These Nationals were one big record mashing event with whole bunch of marks coming down. On Friday in women´s 1500 free Lotte Friis broke her own one year old record time of 16:03.13 and went to whole new territory with her 15:53.22. Her splits were 1:00.83 – 2:05.48 – 4:14.20 – 8:29.10. On Saturday Mads Glæsner broke another record, this time in 1500 free. Jacob Carstensen’s record time from year 1998 14:48.96 saw almost four seconds drop off as Mads clocked 14:45.16. His splits were 56.47 – 1:55.30 – 3:53.29 – 7:50.57. Jeanette Ottesen broke her own 50 fly national record time of 26.42 from earlier this year with 26.30. Sunday saw two familiar names breaking national marks. Jeanette Ottesen started with new record in 100 free, when she broke Mette Jacobsen´s record time of 54.54 with her winning time of 54.33. Lotte Friis broke another record, this time in 800 free. She clocked 8:18.01, breaking her own record time of 8:22.38 from 2004 with quite a big margin. Her splits were 59.57 – 2:02.29 – 4:08.59. The first round of competition. The shortlist of candidate cities will be announced on 19 November 2007 by IOC. Then there will be futher analysis, maybe some visits to candidate cities and IOC members will elect the host city in February 2008. FINA/ARENA Swimming World Cup 2007 – Singapore. Days 1 and 2. Bit of a mild kind of sizzling in the pool but one world record saved the day at Singapore FINA / ARENA Swimming World Cup 2007. Therese Alshammar once again flirted with world records, 25.69 against current record time of 25.33 in 50 fly and in 50 free 24.02 with current record being 23.59. South African Roland Schoeman gathered bunch of golds with wins 100 free, 50 breast, 100IM and 50free. Randall Bal took the backstroke triple (23.94 – 50.91 – 1:52.88) and Russian Nikolay Skvortsov fly triple (23.48 – 51.47 – 1:53.26). Swede Joline Höstman just missed breaststroke triple (1:07.41-2:25.42) when Olivia Halicek beat her in 50 breast with 31.27 against Joline´s 31.29. Joline´s 100 time was second fastest ever in Sweden. But there was another chance of world record for Natalie, this one was in 100 medley where she dipped under one minute mark clocking 59.12. Not that far from her own world record time of 58.80, also from year 2002 and from that same New York pool. The difference might have been that she opened in 2002 with 26.41, now with 26.55. Next one in the World Cup-series is Sydney, Australia from 2nd to 3rd of November. Jason, Jason, where are you? There has been lots of talk in the internets about whereabout of Jason Lezak training-wise. His coach Dave Salo took the USC job last year and people have been wondering about where´s Jason gonna train now that is mentor is gone. Some rumours where about his move to Rose Bowl Aquatics with some sponsorship money, and there were some other sightings of Jason in Irvine Novaquatics-pool, his old home. I’m training in Irvine most of the time, but I also train at Rose Bowl where my team is that sponsors me. Training is going really well and I’m looking forward to the upcoming year. You are currently browsing the Uinnista weblog archives for October, 2007.